"All the sports coverage you can get"
The Sports Cycle’s Donnie Dwyer is at the Rose Hill Gym as Fordham loses it’s 5th straight game 85-66 to VCU. Freshman Jon Severe and Sophomore Mandell Thomas had 14 points apiece while Senior Guard Branden Frazier had 10 points in the loss. 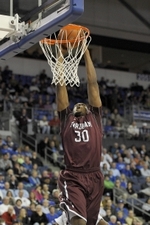 Junior center Ryan Canty had 2 points to go along with 10 rebounds and 4 blocks. The Rams take on LaSalle this Saturday at 5pm on their home floor. Today made it 12 teams! 12 FCS (DIV 1-AA) have defeated FBS (DIV 1-A) teams this season. 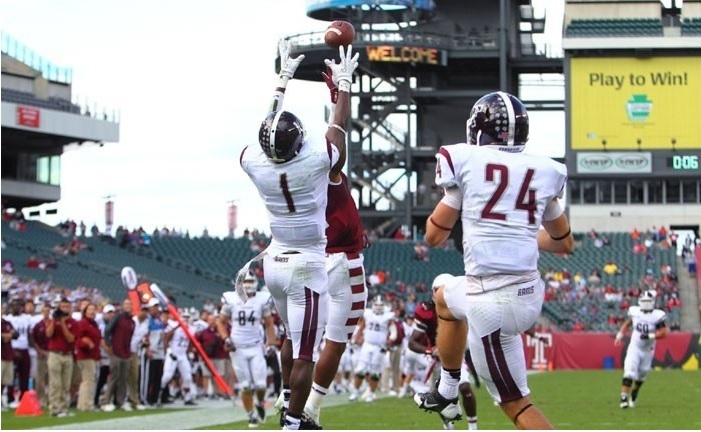 Fordham defeated Temple in Philadelphia, PA 30-29 thanks to a 29 yard touchdown strike from Mike Nebrich to a leaping Sam Ajala in the end zone with 4 seconds left on the clock (Highlight below). With the win, Fordham is now 3-0 on the season and beat an FBS opponent for the first time since 1954 season with a 13-7 win over Rutgers. This season has been special so far for Fordham. Last week they beat #8 ranked Villanova on their home turf for the first time in school history, this team advance to 3-0 for the first time since 1988, and the Rams played their first game at an NFL stadium since 1983 when they faced St. Norbert’s College at Lambeau Field. So where does this win rank in Fordham Football history? It may not be at the top, but it certainly is very high compared to recent history against FBS schools (Losses to Buffalo in 1993 and 1995, Army and UConn in 2011 and Cincinnati 2012). Last time Fordham was relevant in the FCS was 2007 when they lost to UMass in the first round of the FCS Playoffs. This team has struck magic in the early going and I hope they can keep it up going into next week. The Rams host Columbia University next week at home for a 1:00 p.m. contest in the annual Liberty Cup game. I know the stands will be packed with maroon and white as fans will start entering Jack Coffey Field with smiles on their faces. It’s a new era of Fordham Athletics. This is just the first step in bigger success coming to multiple programs. It’s time to get excited in the Bronx. CBS 58’s Donnie Dwyer covers everything in Wisconsin Sports from the Badgers and their Rose Bowl match against Oregon, Aaron Rodgers and the big win for the Packers to continue perfection. 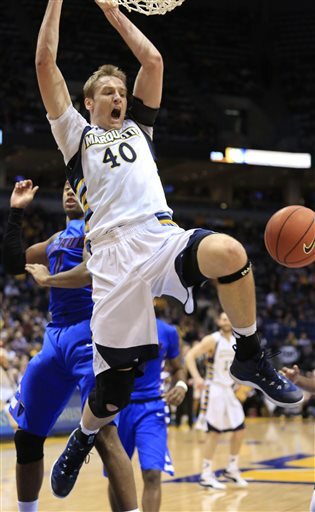 Marquette basketball travels to New York City to play in Jimmy V Classic against Washington. They are ranked #11 in the nation. Tune in to get all the information you want! Although he’s an afterthought when it comes to NFL accomplishments, former Utah Utes quarterback Alex Smith led one of the most groundbreaking teams in college football history. 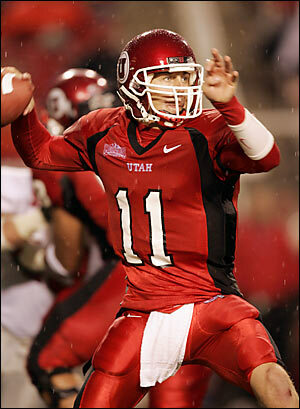 The 2004 Utah Utes team was expected to be good, they began the season ranked 19th in the country. However, few expected the team to blast through 11 opponents en route to an undefeated regular season – and they did just that. The reason this season was so significant wasn’t just because of the perfect season, it was also because of the conference Utah was a part of. The Mountain West Conference is not an automatic qualifying conference, meaning that the conference champions do not earn a spot in one of the BCS Bowl Games, considered to be the biggest games of the post-season (Sugar Bowl, Rose Bowl, Orange Bowl, and Fiesta Bowl). When the Utah Utes earned a spot in the 2004 Fiesta Bowl opposite the Pittsburgh Panthers, it was the first time in college football history that a non-AQ team made it into a BCS Bowl game. The question then turned to whether or not the Utes were a good football team, or the product of an easy schedule – they didn’t play a single ranked team all season. All doubt were put to rest when the Utes blew out Pittsburgh 35-7, proving their status as one of the best teams in college football. Fast-forward to the present, four schools have now become “BCS Busters” by breaking into a BCS Bowl game from a non-AQ conference (Utah, TCU, Boise St., Hawaii). Against opponents from an AQ conference, BCS Busters are 4-1. Of all of the total seven BCS Buster appearances however, none have ever participated in the National Championship game. Last year’s undefeated TCU team, that beat Wisconsin in the Rose Bowl actually received some first place votes from AP voters at the end of the season, but it was for naught and the BCS title game winner Auburn remained the undisputed National Champion of the season. 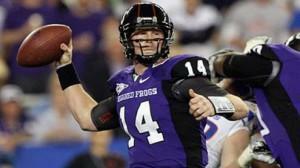 However, despite TCU’s success the clear leader of mid-major conferences against the BCS is Boise St. Since 2004, Boise St. has four undefeated seasons and a one-loss season to their credit. They stunned the heavily favored Oklahoma Sooners in the 2006 Fiesta Bowl, and have beaten fellow BCS Busters TCU twice in the Fiesta Bowl. During last season, Boise St. was a near lock for a BCS Bowl all year until an overtime stunner against Nevada knocked them out of contention. Should a team with the impressive credentials of Boise St. be dropped from major bowl contention because of a single loss? A three-point loss in overtime at that, and against a ranked team in Nevada. 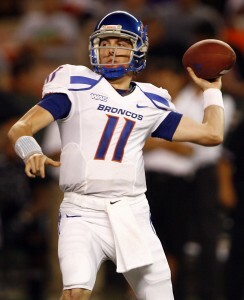 Boise’s season was disregarded due to their conference – the Western Atlantic Conference, a non-AQ conference. 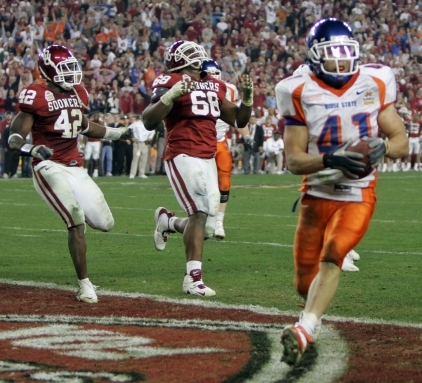 It wasn’t Boise’s first snub from BCS selection either, in 2004 an 11-0 record and #9 ranking wasn’t enough to earn them a spot in a BCS Bowl, as well as a 12-0 season in 2008. 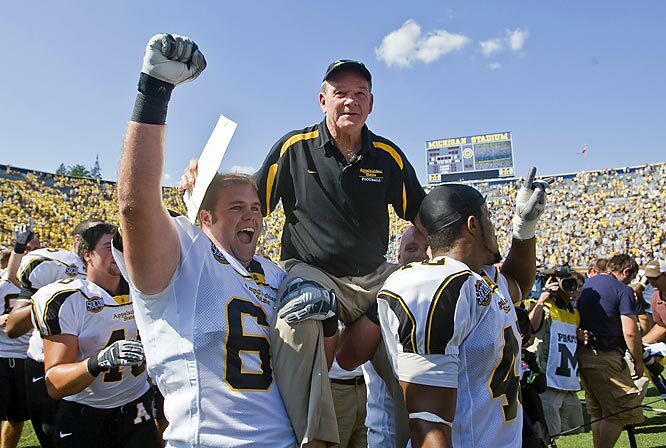 In fact, they ended the 2004 season as the only undefeated team in College Football, yet didn’t earn a spot in the National Title game (which hosted a one-loss Florida Gators squad). The common criticism against Boise St. and other successful teams from non-AQ conferences, is the lack of competition they face year-round. After all, a team that spends the year beating push-overs wouldn’t be able to hang with an SEC team used to playing the very best on an almost weekly basis, right? Not quite. Boise’s season opening blowout of SEC powerhouse Georgia seems to have finally opened people’s eyes to just how good mid-major teams can be. Currently 2-0, and ranked 4th in the nation will this be the year that BCS polls finally invite Boise St. into the National Championship game? Or will the constantly underappreciated Broncos find themselves snubbed by voters once again? Only time will tell, but at this point it’s hard to argue just how competitive non-AQ teams are capable of being.